If you read the last post on reading drafts, hopefully you now have a good idea of how they work, but be prepared to come across a couple of variations! The most common variation is the lack of the “drawdown” so you see just the threading and treadling guides. The next variation doesn’t use black boxes. Instead, the threading guide, shows the shaft number and the treadling guide uses slashes. You’ll also notice in this example, that repeats in the pattern are summarised – the 5x notation – and this is a common way to keep drafts a useable size. Here the number of ends in each colour and the colour order is shown – i.e. a threading guide – but the weft colour instruction is in the text accompanying this. 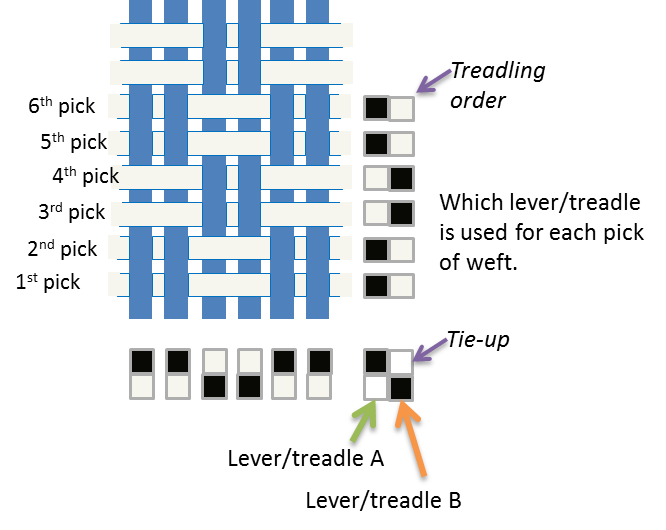 And for rigid heddle patterns – particularly those that use pick up sticks – you will see patterns written out like a knitting pattern; saying “two over, three under, two over” etc. So, that’s the essentials of navigating patterns and drafts. 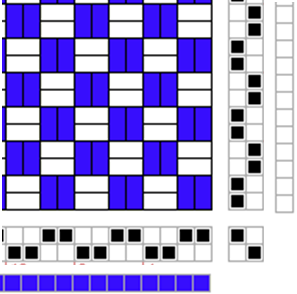 Weaving drafts can be a bit brain bending at first, because all you see is a graph without any words. Also, because the little coloured boxes in the draft mean different things depending on which part of the draft you’re looking at! Once you get the hang of them though, they are a great tool. So, let’s start with a draft for some basket weave, and imagine you’re sitting at your loom looking at this cloth; the bottom edge of the diagram is your cloth beam and the top edge is your fell line. 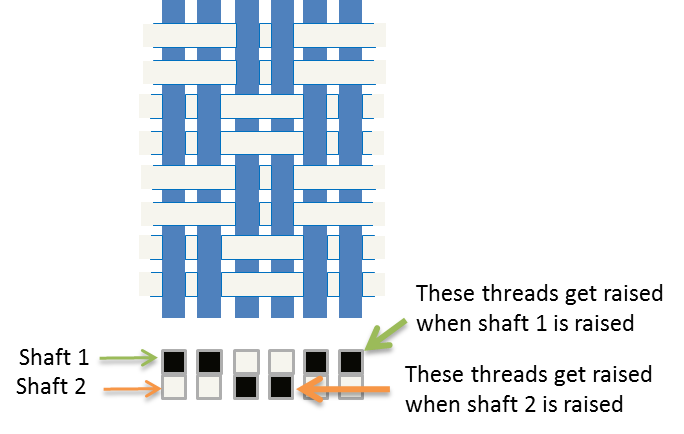 So this part of the draft is your threading guide, with the black boxes indicating which warp thread goes on which shaft (for a rigid heddle loom, what goes in slots or holes). The big area in the middle is called the draw-down and shows how the threads interlace. This isn’t always included. Nor are the two sets of coloured boxes along the outer edge that show the colour order for warp (bottom) and weft (side) always shown. One final note: In this example I’ve shown the threading guide and tie-up at the bottom of the draft, but you often see drafts where this sits at the top. The only difference when a draft is laid out like that, is you read the treadling order from the top to bottom rather than – as here – bottom to top. In another post I’ll look at other ways that weaving patterns are written. So, your loom is set up and you’re ready to go. Now what? The first thing you do is to open a shed so you can pop some scrap yarn in as weft, and then an alternate shed so you can do another pick of scrap yarn. You will start to see your warp threads even out (they’re usually bunched from being secured at the cloth beam). Note: you can also use paper/ card strips to do this. Now you’re ready to start your pattern, so you grab your shuttle/s and work out what comes first in the “treadling order” i.e. which shaft/s get lifted first and which weft colour/yarn goes into that shed. If you’re doing a complicated or varying pattern, it’s good to put the instructions somewhere easy to see and where you can easily to mark off progress. You might leave a nice long tail of weft sticking out on the first pick, if you want to use it to hemstitch the raw edge later, but for each pick of weft, you pass the shuttle through the shed and out the other side, leaving it at an angle (about 45 degrees seems to be recommended). This is so there is enough thread there to get pushed into place when you beat, without pulling at the edge where the weft entered the shed. You bring your beater forward and push the thread into place. Then you use the next treadle/lever to be pushed and wrap the weft around the selvedge and pass the weft through the “new” shed in the opposite direction, again leaving an angle of thread. Beat. Repeat according to the pattern and when the “fell line” (i.e. where you are laying in new weft) gets too close to the reed, or the shed gets too shallow to pass the shuttle through comfortably, wind the bit you’ve woven onto the cloth beam. That is weaving! When you use all the warp on the loom, you are generally going to hemstich the raw edge at both the warp beam and the cloth beam ends to stop them fraying. Finally, you’ll take the cloth off the loom, which I have to say is a very nice feeling.